It’s Saturday, June 13, and I’m contemplating life without a finger after the small pine block I’m ripping at an angle on my table saw jumps out of my hand just as I get close to the ferociously spinning blade. My junior high school shop teacher wouldn’t be amused, but I don’t have a band saw and the big pinewood derby race is only a day away. Safety third! READY, STEADY, GO! 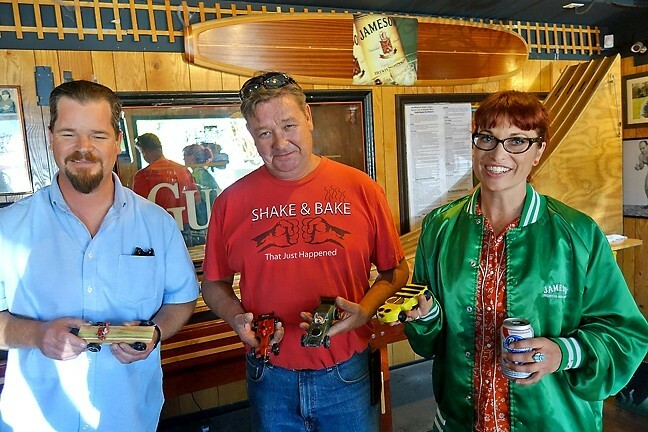 : McCarthy’s Irish Pub plays host to adult pinewood derby races on the second and fourth Sundays of the month. I manage to cut the 7-inch block into an acceptable wedge, but by the time I’m pushing my wife’s block through the saw (As a rule, Anna doesn’t operate table saws), I’m nervous and end up mangling hers, which becomes mine because she looks really disappointed, and nobody wants a disappointed wife. Anna’s watched the tutorials online and knows the tricks—aerodynamics, having one front wheel off the ground to cut down on friction, canting the rear wheels, placing weights an inch in front of the polished rear axel, and generously lubricating the wheels and axels with graphite. We’re in it to win it! We spend several hours shaping and painting, or in my case Tung oiling, our cars. We got various grits of sandpapers at the hardware store and lead fishing sinkers at the sporting goods store to get our cars to exactly 5 ounces. We’ve completely gone overboard, and when you add in the $10 derby car kits we bought at McCarthy’s Irish Pub, we’re more than 50 bucks in. INSTIGATOR! 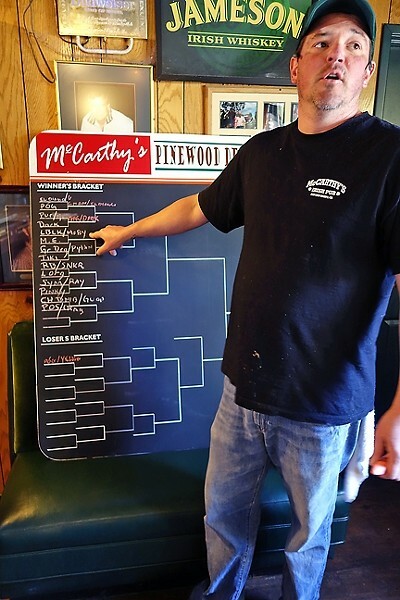 : McCarthy’s bartender and race organizer Patty Kirby fills out the bracket in the double elimination races. Now it’s race day, Sunday, June 14, about 12:30 p.m., and Anna and I just paid our $5 entry fees, which come with free beers. All the money goes to local Boy Scout Troop 322, which meets at the Elks Lodge. We’re sitting outside sipping our beers when our friend Rosemary walks up and shows us her two cars, festooned with chromed pipes and a motor sticking out. “That’s a lot of bling,” says Anna. “You see bling. I see drag,” I say, giving Rosemary a steely look to show how competitive I am. She and Anna go in for a test run but I don’t want to show how fast my car is until the races begin … and we’re almost there. Just 30 minutes to race time! 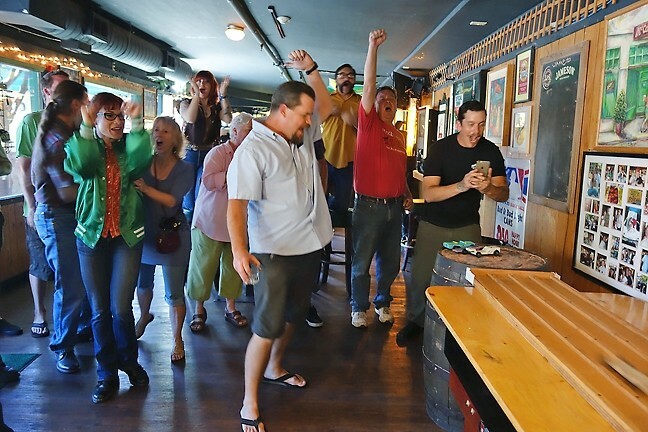 The track, which organizer and McCarthy’s bartender Patty Kirby found on the Facebook page “Man Stuff/Buy/Sell/Trade,” is set up on the bar’s shuffleboard table. Racers are fine-tuning their cars, and soon Patty’s assistant Cheri is drawing names from a hat to determine the double elimination round races. Car names are entered on the chalkboard bracket made by Dave “Mad Dog” Norton. THE CROWD GOES WILD! : Each race is captured on cell phone video to capture the too-close-to-call photo finishes. All told, 22 cars are entered, and the woman to beat is Talitha, whose bumblebee-shaped car Rita-bee is the reigning champion. Talitha studied physics at Cal Poly, but her secret weapon is her engineer boyfriend Stan, who designed her axels and found special narrow wheels online—less drag! Talitha’s sporting the coveted Green Jacket, which the current winner gets to wear at the bar until the results of the next race, which by the way are held on the second and fourth Sundays of the month until football starts, and then they’ll be held on every other Saturday. “Yeah, it smells a little funny,” Talitha admits. IN THE WINNER'S CIRCLE: (Left to right) Second-place finisher Donnie, third- and fourth-place finisher Brian, and first-place finisher Talitha enjoy their moment in the spotlight. The races start, and Mark is stationed at the end of the track to capture each race on his camera phone. I soon know why some races are too close to call with the naked eye and must be reviewed to determine the winner of the photo finish. My first race is the fourth, and I carefully place my car, “The Tiki Wagon,” into the Lane 3 slot. Whoosh! The lever’s pulled and they’re off. Oh the agony of defeat! Third out of three cars. Now I’m entered in the double elimination losers’ bracket. Well, I’m not out yet, but it’s clear my car isn’t competitive. Long story short, I make it through two more races before being completely eliminated in my fourth. Anna’s out too, but the tension is still building as we come down to Talitha with Rita-bee, Donnie with The Crab Roll, and Brian, who’s got two cars in the finals, Green Dragon and El Diablo! JOIN THE DERBY! 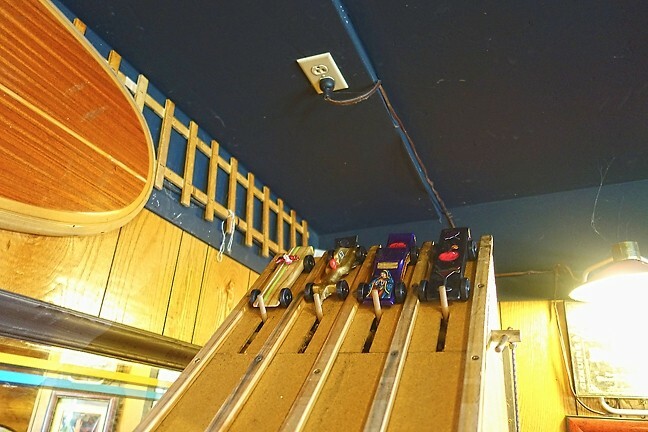 : Anyone old enough to get into McCarthy’s Irish Pub is invited to join the pinewood derby. Buy kits online or pick one up for $10 at the bar, and then bring your car and $5 entry fee to the next race on Sunday, June 28. The crowd is loud as these speed racers fly down the track, but after it’s all said and done, it’s Rita-bee for the win! Looks like Talitha gets to wear the smelly green jacket for another two weeks. Meanwhile, Anna and I will be shopping for better wheels and axels because WE’LL HAVE OUR REVENGE!